BACK AT IT. 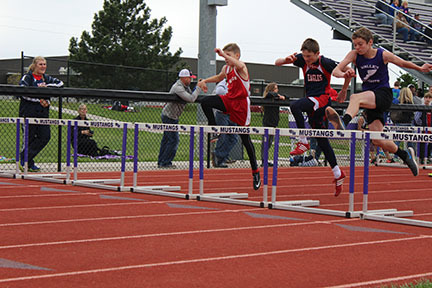 The Jr. High Track team is starting their season up again, beginning practice on February 26th. The Mustangs are looking forward to an outstanding season under the direction of Alex Nolte and Cale Green with successful eighth graders returning and promising seventh graders. “These kids are all pretty excited about the season because of the long break between sports. They are ready to get back in the swing of things,” says head coach, Nolte. They start off the season with getting in shape and then slowly transition to focusing on their running and field events. Along with new seventh graders joining the team, Cale Green, High School Special Education Teacher, is the assistant coach this year. Following the retirement of Crystal Gordon, Green is excited to take on this position, saying, “I’m most excited to see how the kids perform, being at a new school, but we are really here to make sure they have fun.” The thirty-five members of the track team are working hard, hoping for nice weather, and ready to show off their talents on March 29th, their first meet.